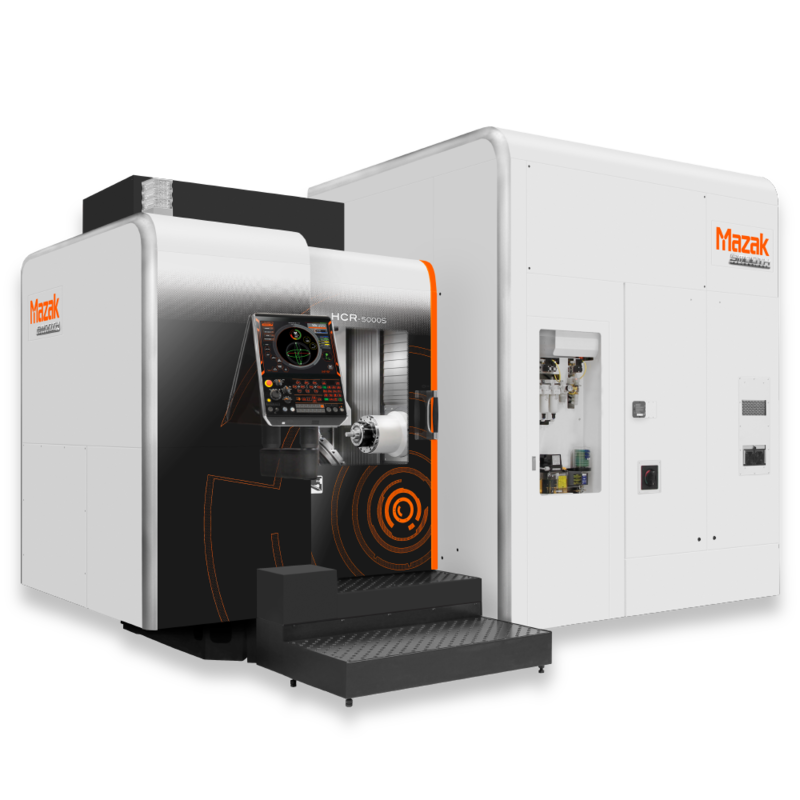 Yamazaki Mazak’s high-power full 5-axis horizontal machining centre with a unique tilting rotary table is specifically designed to meet the high-speed aluminium cutting challenges synonymous with the aerospace industry. First launched at EMO 2017, the exceptionally agile HCR-5000S benefits from a high jerk rate and ultra-fast acceleration of 0.8-1G, as well as high-speed feedrates of 60m/min in the X-,Y- and Z-axes. Combined with rapid traverse rates of 30-50rpm in the A- and C-axes, cycle times have been dramatically reduced. Roller gear cam is also utilised in the A- and C-axes to deliver positioning accurate to 0.0001˚, while high-rigidity linear roller guides in the X-,Y-, and Z-axes provide the low friction required to facilitate a wide range of machining, from heavy-duty to high-speed cutting. The HCR-5000S is fitted with a 12,000rpm 18.5kW high-performance milling spindle as standard, which is designed to minimise vibration during high-speed operation and also prolong tool life. Built-in spindle temperature control limits any thermal change to the spindle by circulating cooling oil around the spindle bearings and headstock. Other spindle variants ranging from 18,000rpm to 30,000rpm are also available as optional upgrades. One of the stand-out features that sets the machine apart from other models in its class is its Ø630mm tilting rotary table, offering a large Ø700mm and 500kg workpiece capacity. Given the high volume of chips created when machining aluminium, removing them quickly and efficiently is critical to maintaining performance. The HCR-5000S provides trouble-free evacuation of large chip volumes via a newly-developed base and tilting rotary table design which has an A-axis swing of -90˚ to 135˚. During cutting, coolant is discharged from nozzles located on the spindle housing, which flushes the chips to a central trough in the machine bed, feeding the chip conveyor located underneath the bed. Given the size of workpieces the HCR-5000S is capable of processing, workflow ergonomics and ease of operation were integral elements of the design. An overhead crane can be used to prove easy loading / unloading of workpieces, while the step located in front of the operator door facilitates a fast set-up due to the operator proximity to the workpiece on the table and tool in the spindle. What’s more, the adjustable SmoothX CNC control panel can be tilted to the optimum position for the operator.